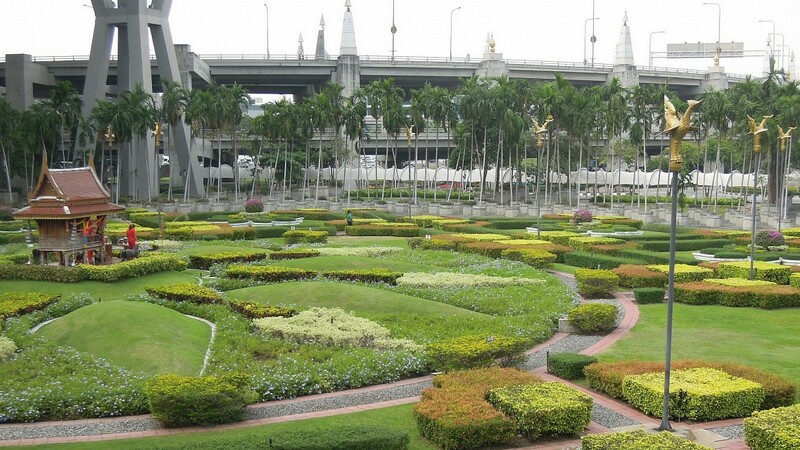 Bangkok is serviced by two international airports: Suvarnabhumi (New) and Don Muang (Old) airports. 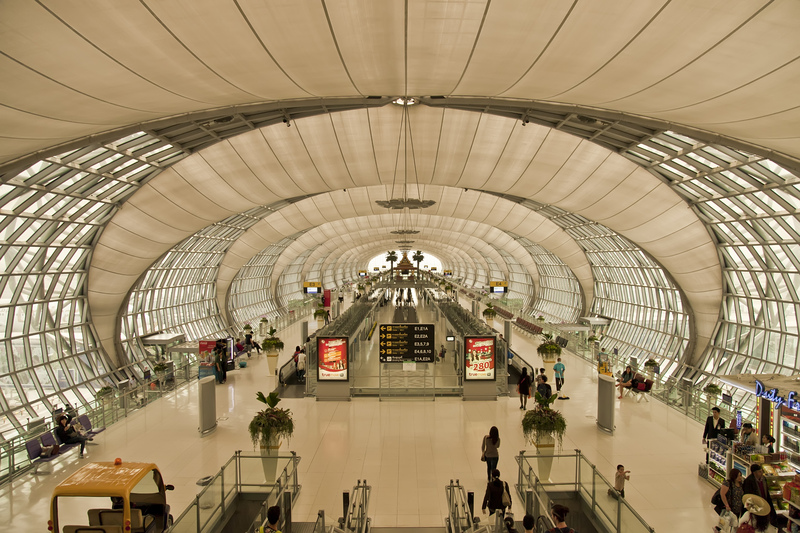 The great majority of international carriers fly into the new airport, whilst budget liners like AirAsia and Orient Thai still utilize the old airport due to its relatively lower tax. Both airports are about 30kms out of Bangkok’s city center and getting to and fro could take anything up to two hours, depending on traffic. Suvarnabhumi is Southeast Asia’s busiest hub and one of the largest in the world. The one and only terminal, which services as both domestic and international flights, is extensive and chock-full of facilities and service providers. 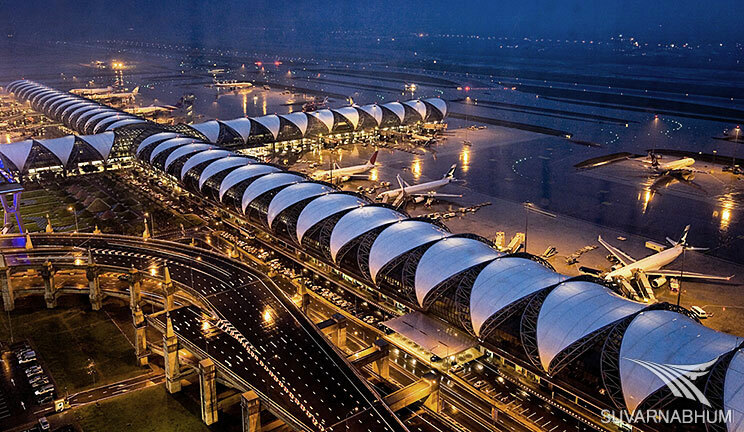 This newly improved airport, which was built in 2006 to replace the ageing Don Muang, is said to be one of the most striking-looking airports ever built, even though it has been plagued by problems and criticisms almost non-stop since its inception. Lack of free WiFi is, for example, a bewildering oversight. Nevertheless, the architectural masterpiece, designed by a Chicago-based company, is quite impressive, especially viewed from above. It comprises a glass and steel, sail-shaped canopy, with various concourses shooting off on both sides. Keeping the terminal climate controlled was one of the biggest challenges the constructors faced. The addition of perfectly landscaped, exterior gardens and beautifully decorated interior, make this one of the most charming airport you're likely to ever see. 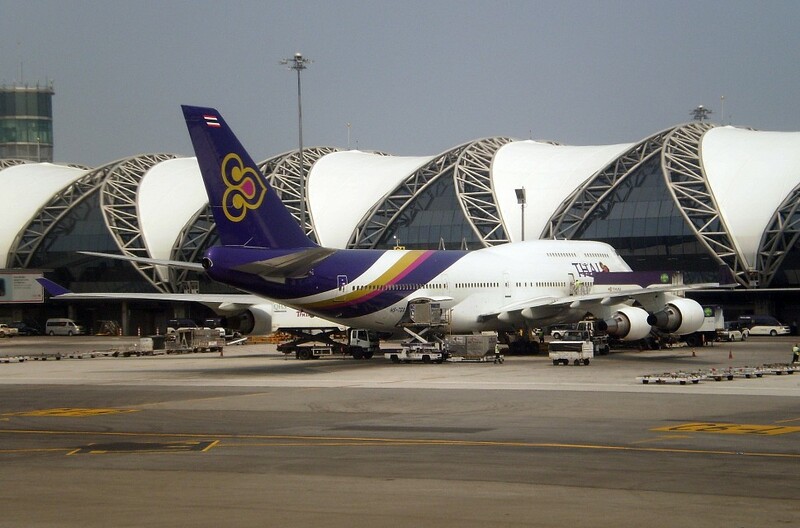 The Bangkok International Airport is, unsurprisingly, the main hub for Thai Airways. 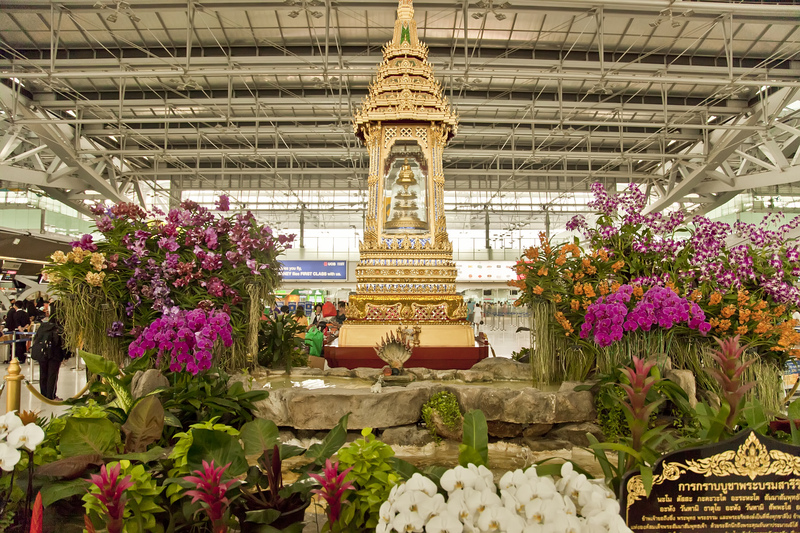 Because Thailand is one of the most popular vacationing countries in the world, over 50 million people flow through Bangkok International Airport every year, which helps make it one of the world’s busiest hubs. The single terminal, which covers a mind-boggling six million square feet, is the fourth-largest terminal ever built. 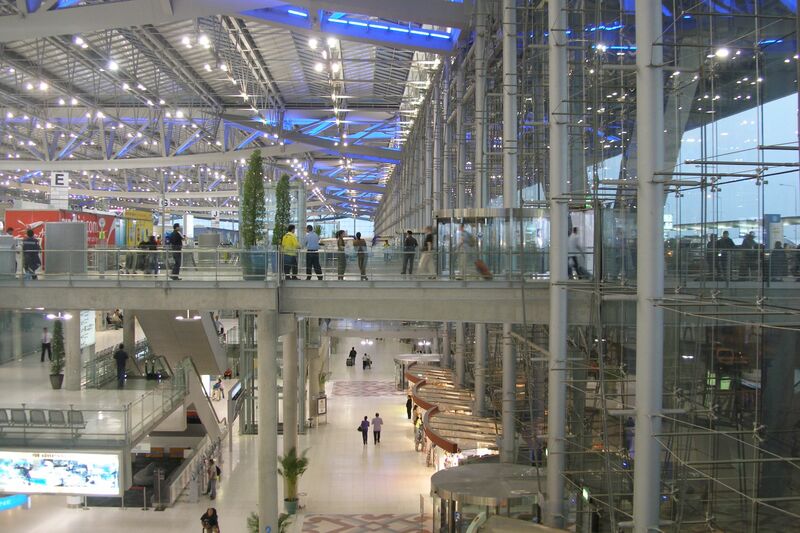 The airport boasts more than 350 check-in counters, 22 luggage conveyors, 100 elevators, and 26 customs control desks. Thai Airways and 9 other airlines offer CUSS (Self-service check in) at the Bangkok International Airport. 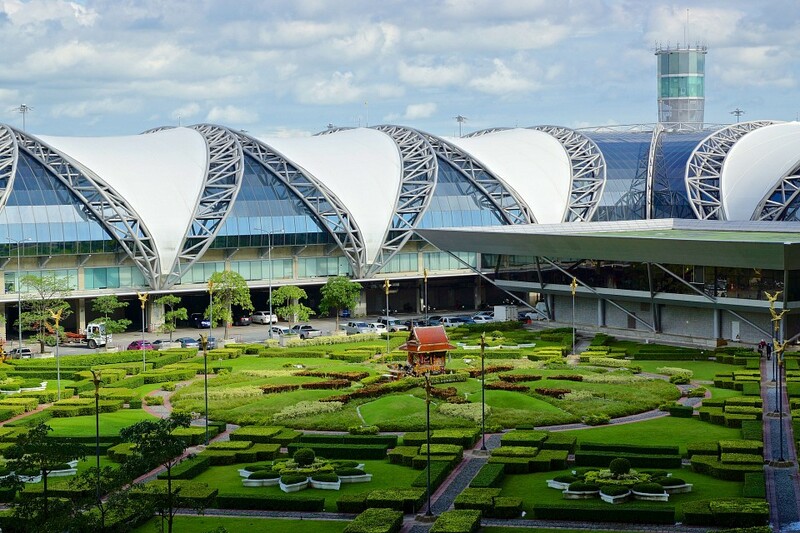 Further terminal and runway construction plans are underway, as Bangkok International Airport is expected to face incoming traffic, within the next decade, of more than 100 million people. The airport was built at a cost of 5 billion USD. There are a total of 10 information desks spread around the airport, with the most convenient being at gates 3 and 7 of the Arrivals Hall, and gates 3 and 5 of the Departures Hall. Staff here will help with anything airport-related, whether that be connecting flights, lost baggage, etc. Tourist-specific info desks are also found near gates 3 and 10 of the arrivals' lounge and they, on the other hand can help you with taxi, transfer, hotel, and tour bookings. If you’re in Bangkok just for the day, this is where you can book a four, five or seven-hour sightseeing tour of the city. Here you can also pick up copies of city maps and tour brochures. ATMs are found in Terminals 2, 3, and 4 while a currency exchange booth is on Floor B of Concourse D. Although you will need some local currency upon arrival (especially if planning to catch the bus or train), try to change as little currency as possible, as the exchange rates here are very inflated. 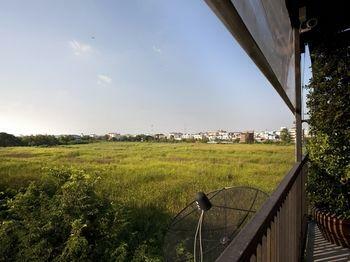 The airport is found 25kms south-east of downtown Bangkok. There are several different ways to get to and fro. 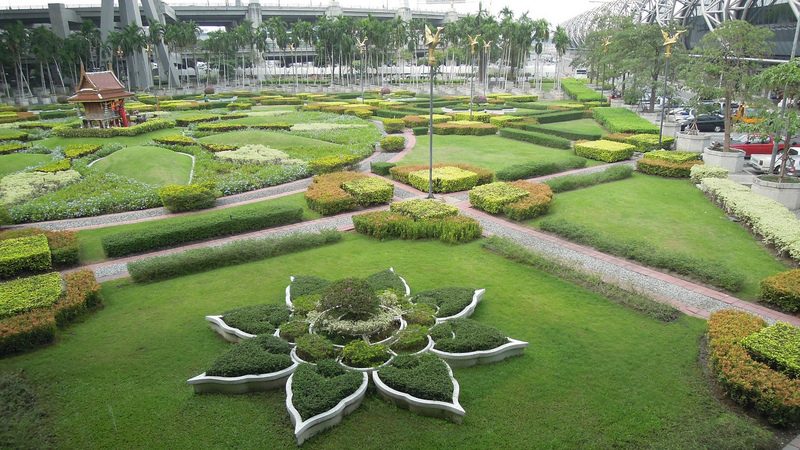 The fastest and most convenient way to reach town, the Bangkok Airport Link takes about 20 minutes to reach Phayathai Station (from where you can connect to the BTS Skytrain) and makes half a dozen stops in between. You’ll find access from the first floor of the Arrivals Hall, where you’ll also find token booths. A single ride costs ฿90 ($2.79) and the ticket machine accepts both coins and notes. Please do note that the rail link operates from 6 a0 feet until midnight and, if you’re travelling with at least two more passengers, this will actually be more expensive than taking a taxi. The most convenient door-to-door transfer is by taxi, although thanks to the plethora of taxi touts hounding tourists as they set foot outside, this can be a rather disconcerting option. Head to the first floor of the Arrivals Hall instead, and buy a one-way taxi fare from the Public Taxi counter. A ride should costs anywhere from ฿250 ($7.75) to ฿400 ($12) depending on your destination. The counter staff will be in charge of locating a taxi driver for you. Keep your half of the ticket and read it carefully; it contains info on what to do should anything go wrong. Bus services are cheap and plentiful although they can be a tad inconvenient if you’re travelling with a lot of luggage. Fares vary between ฿15 ($0.47) and ฿60 ($1.86) depending on where you need to go. The Airport Express Bus is the fastest way to go. It operates on four routes, and rides cost ฿150 ($4.65). There are also several public buses which ply the route from the airport, but you must reach them at the Airport Transfer Gate. Head to the second floor of the Arrivals Hall and ask at the info counter. For ฿990 ($31), you and your family could travel in air-conditioned style in a private sedan, which can carry up to 3 passengers. Mini vans are also available for private rental, costing ฿1,200 ($37) and carrying up to 9 people. There’s a free transfer bus which operates between Bangkok’s two international airports, however this is a very time consuming trip to undertake so give yourself at least a three-hour buffer. The airport transfer is accessible from gate 3 on the 2nd floor of the Arrivals Hall. 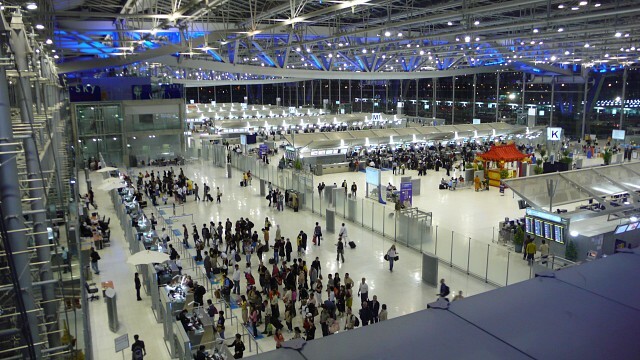 There are over 50 dining options at the Bangkok International Airport, with a great majority being fast-food outlets and snack bars. At the departure lounge you’ll find a Japanese noodle house, Chinese buffet, Italian pizza, and the über-famous Thai chain, Mango Tree. The usual array of fast-food places, like Burger King and Dairy Queen, also have branches at the airport. Half-way through Concourse D are half-a-dozen trendy-looking bars, where good food is served alongside a vast array of wine, cocktails, and beer. Starbucks lead the coffee-trail, with at least another seven coffee houses filling in the spaces between restaurants and souvenir boutiques. 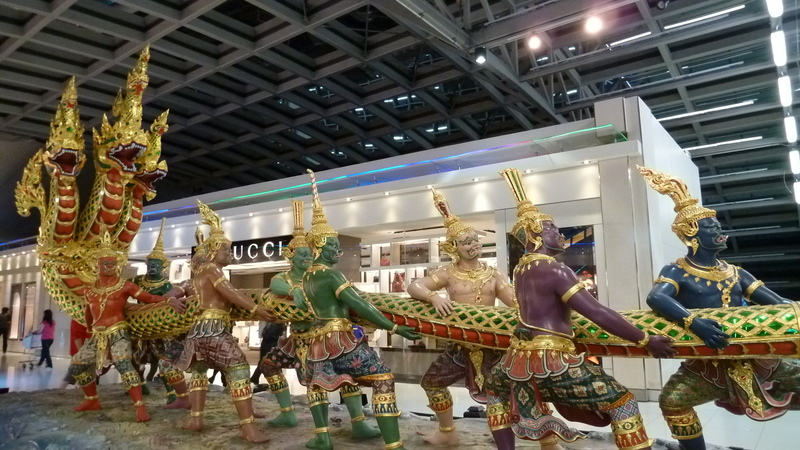 If you like shopping for duty free then you’ll be in your heavenly realm at Bangkok International Airport. A mind-boggling array of retail outlets offering alcohol, tobacco; cosmetics, perfume; fashion, souvenirs; and more are found both in the Departure and Arrivals Halls. Designer brands are well represented, with the likes of Salvatore Ferragamo, Bally, Bvulgari, and Dior (among others) having dedicated boutiques here. Wonderful Thai souvenir shops abound, with many selling hand-made artifacts. The most distinctive is OTOP, which encourages and employs local villagers to hone in on a particular arty skill and create unique items which can be found nowhere else in the country. This is a great spot to buy crafts made by hill tribe villagers from northern Thailand. Free WiFi is available throughout the airport, however it is only free for the first two hours. After that you’ll be expected to make a payment. 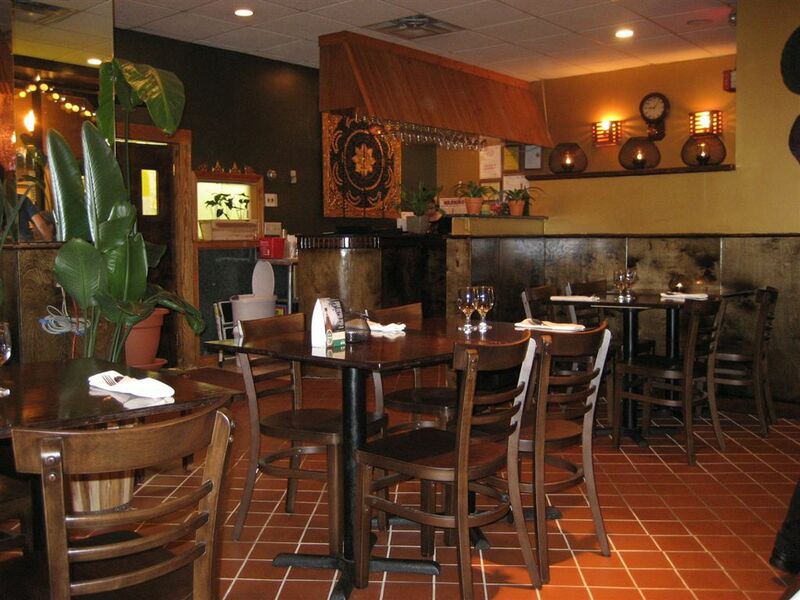 Many of the dining outlets also offer their own WiFi, yet most have a 15-minute limit. Got a few hours between flights? Then head to Concourse B and D where you’ll find several long-haul rest area equipped with comfortable, reclining chairs. This area, however, tends to get quite crowded, so if you want a quieter stay head down to the lower levels (towards the train entrance) where it tends to be less crowded. 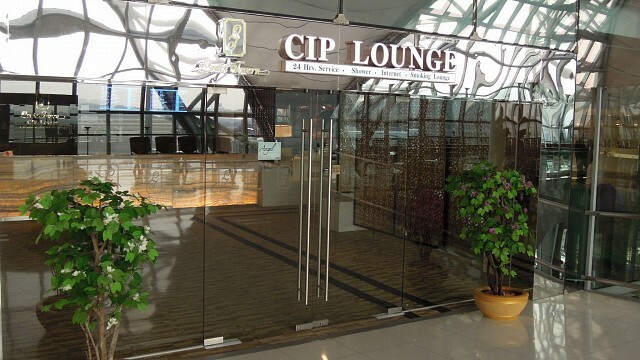 If you’re stuck at Bangkok International Airport for longer than just 2-3 hours, it may pay to indulge in a few hours’ stay at the Louis’ Tavern Clip lounge, which you’ll find on the 4th floor of the International departures Hall. 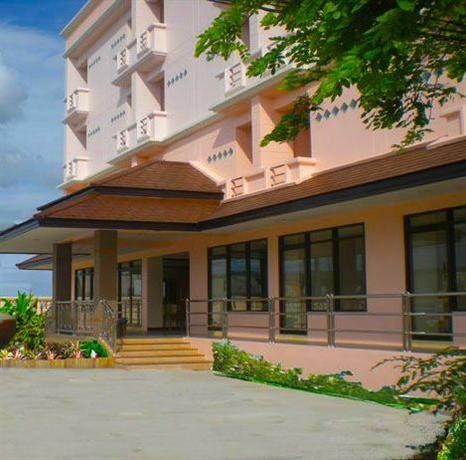 For just over $ 100 USD you could spend six hours resting, showering, dining and drinking at these well-established day-hotel. WiFi is free, you can take advantage of beauty spa treatments and also include food in your entry fee. 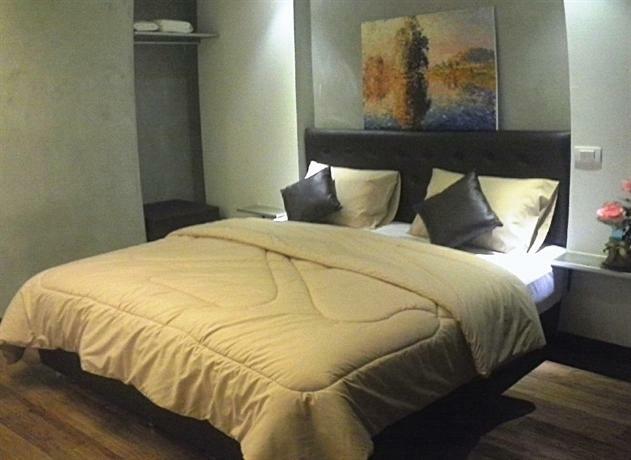 This is certainly not the cheapest ‘hotel’ around but considering you don’t actually have to leave the airport it’s the most convenient by far. 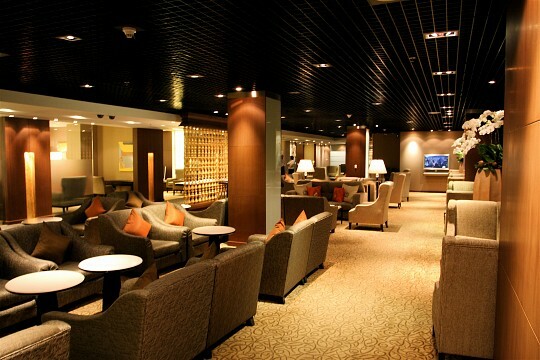 Quite a few of the major international airlines have lounges available for their members. Thai Airways, as can be expected, boasts a few lounges at the Bangkok Airport. 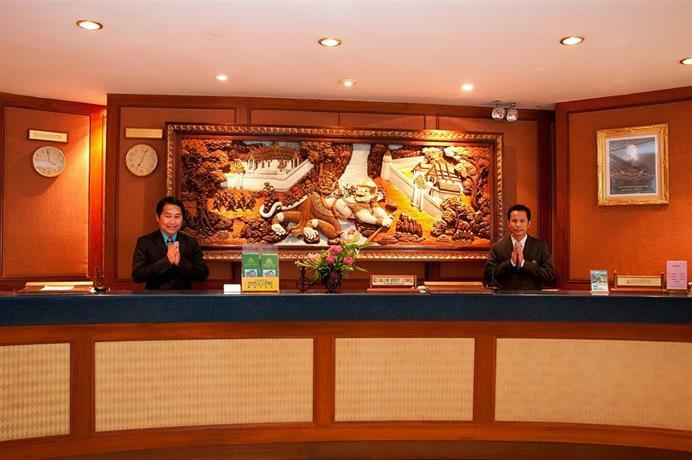 The Royal, Business, and International Silk lounges are comprehensive and offer rest areas, showers and refreshments, as well as traditional Thai beauty treatments, entertainment, and complimentary business services. Yet where Thai Airways excels is in its First Class Lounge, which is rated as one of the world's top 5. Star Alliance members have access to all Thai Airways' lounges (as per Star Alliance policy) except for the First Class Lounge and Spa, which is for the exclusive use of Thai Airways customers. Qantas and British Airways run a combined lounge which you'll find on the 3rd floor of the International terminal, on Concourse F, right next to the two airlines' First Class Lounge. Both lounges are open to members of the Oneworld Emerald Group (Jetstar included), although admission rules apply so do check in advance. 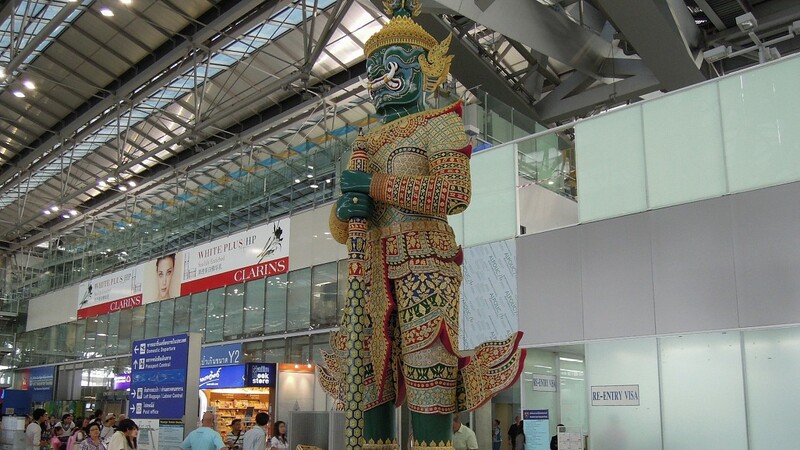 Considering how huge Bangkok International Airport is, we recommend you pay close attention to your airline staff member who will be checking you in. She or he will give you precise directions on how to reach your particular lounge, so listen up, unless you want to waste an hour roaming around aimlessly. 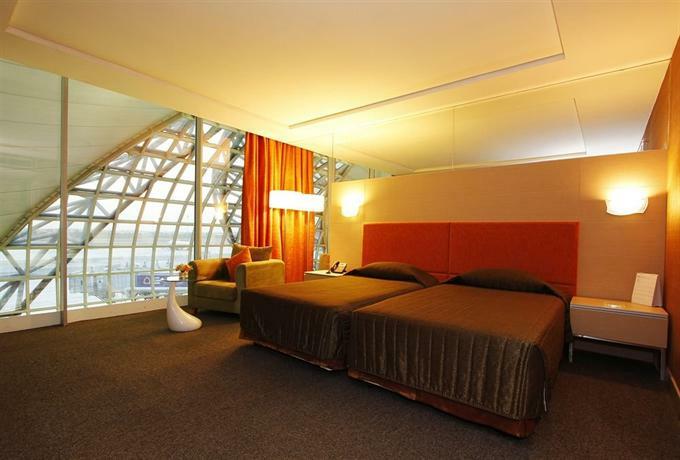 Good, great, and fabulous airport hotels abound, so if you want to spend a comfy night close to the airport, then you’ll have plenty of choices. 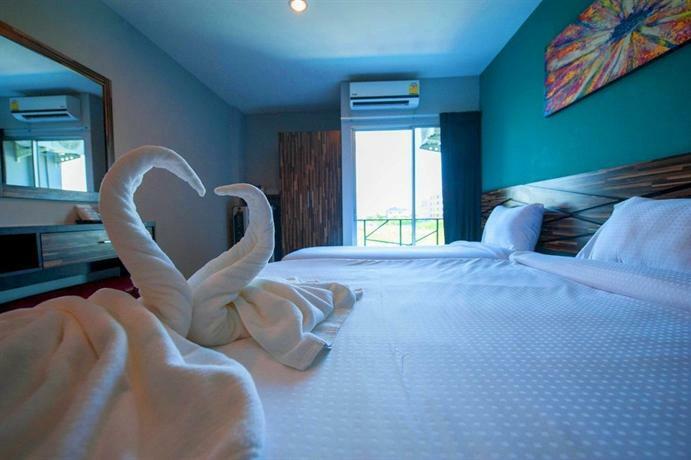 From budget hotels to boutique guesthouses and luxury joints, there’s a hotel near the airport to suit your tastes and budgets. Many offer free shuttle services and most have 24/7 check-in and also offer day rates. The Novotel is the closest to the terminals and, perhaps, the most beautiful. All lounges are also available for us to all Star Alliance members.